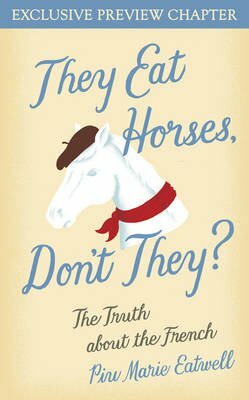 Truth, perhaps, is stranger than fiction...In this short early preview of THEY EAT HORSES, DON'T THEY?, Piu Marie Eatwell explores the background to, and the contemporary evidence for, the idea that the French are voracious eaters of horse meat. We know that the French ate horses in the past, but do they still do so today? The age-old, love-hate relationship between Brits and Frogs has spawned many myths. In recent years our stock of received wisdom about France - land of the sophisticated lover and the wine-fuelled lunch - has been fed by a new generation of myths: notably that French women don't get fat and that their children don't throw food. In the complete edition of THEY EAT HORSES, DON'T THEY?, Piu Marie Eatwell explores 45 such myths in entertaining and fascinating detail. The complete edition will be available for download this summer.